STAR-SPANGLED WAR STORIES FEATURING G.I. ZOMBIE 1. 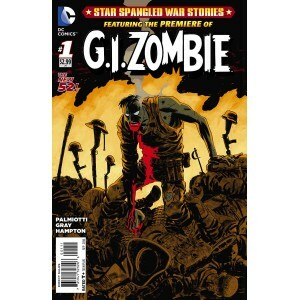 Accueil>DC COMICS>STAR-SPANGLED WAR STORIES FEATURING G.I. ZOMBIE 1. DC RELAUNCH (NEW 52). STAR-SPANGLED WAR STORIES FEATURING G.I. ZOMBIE 1. DC RELAUNCH (NEW 52). Written by: Justin Gray and Jimmy Palmiotti. Meet the soldier they call G.I. Zombie. A man who is neither dead nor alive. Who fights for his country again and again and again! LILLE COMICS Du Mardi au Dimanche. De 14h à 18h. 5 FRANCS 1947 B. LAVRILLIER ALUMINIUM. LILLE COLLECTIONS.